25 years, 8 months, 16 days old age. 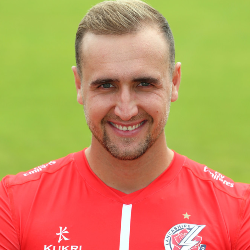 Liam Livingstone will turn 26 on 04 August, 2019. Only 3 months, 14 days, 21 hours, 36 minutes has left for his next birthday. Liam Livingstone has celebrated the total number of 25 birthdays till date. See the analysis by days count and bar graph. Liam Livingstone was born on 04-08-1993 in Barrow in Furness, Cumbria, United Kingdom. He is an English Cricket Player. Liam Livingstone is a hard-hitting English batsman who is best suited for the shortest format of the game. He has a good first-class record and has already made his debut for England’s national team. He made his first-class debut by representing Lancashire in the year 2016. He quickly rose through the ranks and with some exceptional hitting made a niche for himself in T20s. His ability to hit sixes at will made him one of the most feared T-20 player and that is the reason why he has played for so many T20 leagues across the globe. Besides batting, he is also a good enough part-time leg spinner. After getting unsold a few times in IPL auction, he was finally bought by IPL franchise Rajasthan Royals at his base price of INR 50 Lakhs in IPL player auction 2019. He has played for England in 2 T20Is when South Africa toured England in 2017. In the 2 opportunities that he got, he failed to make an impact. Liam Livingstone at the age of 21 scored 350 of just 138 balls while playing for a club match. Though he is considered a white ball specialist, he has a great record in 4-day matches as well. Besides IPL, he has also played in PSL side Karachi Kings.